Question: Tina from Gotta Run Now asked: What are your favorite ways for becoming a faster runner? I’m always working on that goal! Coach Deb: This spring I purchased Run Less Run Faster (affiliate link) and have really enjoyed using their training plan. The book focuses on three key runs: track repeats, tempo runs, and long runs with the goal of keeping the runner injury free while getting faster. All three types of runs have been staples in my training cycles over the years; however, I’ve always included many additional easy conversation pace runs as well – something I cut out during my spring cycle per the book (as an older runner, that seemed like a good plan for me). Before purchasing this book, I worked on speed by running either tempo runs, track repeats, fartleks, and even shorter hill repeats. Check out the links to read a little more about each type of run and give them a try. If you want to get faster, I suggest incorporating one or two of these speed workouts into your weekly schedule taking into consideration your current fitness level and race goals. Question: Will the Nathan hand held water bottle (affiliate link) you recommend provide enough water for me during my runs? I can do 16 ounces per four miles, and I haven’t tried my ten-mile run yet. Coach Deb: The bottle you ordered holds 20 ounces, so that doesn’t sound good. Where do you run? I used to put water out next to my mailbox and friends’ mailboxes and run back by to refill my water bottle if I wouldn’t be running past a water fountain. Some of our trails have water fountains spread out and that’s very helpful. Do yours? Question: What do I do on race day? Do I need to carry an extra bottle with me along with the 20-ounce hand held bottle? Coach Deb: At the race, you’ll be able to get water at water stops and if you ask nicely, they might refill your bottle for you! Question: On my training plan, it says to do one or two miles warm-up and then run x-number of miles. Do I walk the warm-up miles? 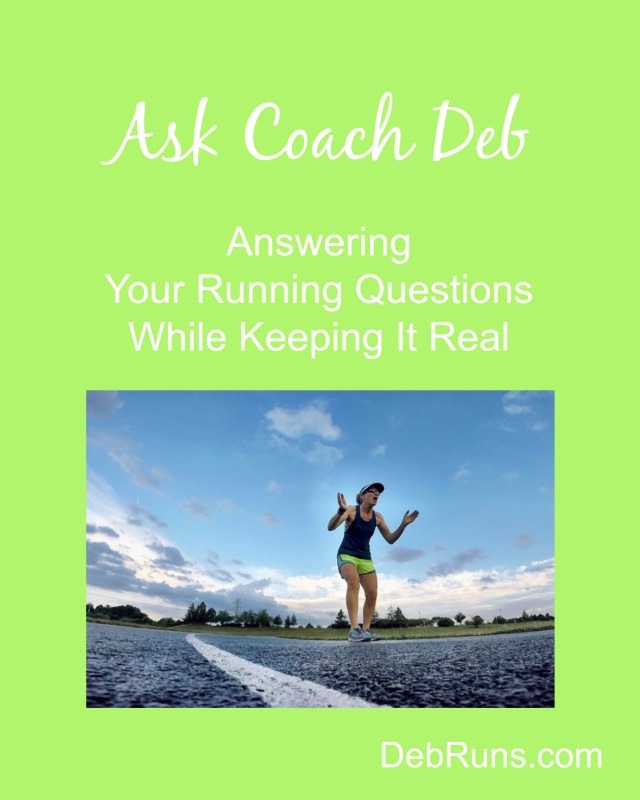 Coach Deb: It’s widely accepted that you run your warm-ups and cool-downs at an easy conversation pace. If you find that you benefit from walking for a quarter to a half mile before moving into an easy run, go ahead and do that. Just make sure your muscles feel well warmed up, and that your breathing is starting to become a little more labored before you move into your speed workouts. The purpose of your warm-up is to not only get the muscles warm and pliable so they’re less likely to overstretch or tear causing a sidelining injury, but also to vasodilate (enlarge) your arteries so they allow blood to flow more easily to get oxygen to your muscles and work more efficiently and more quickly while you’re running. Question: I’m signed up for a 5K on Independence Day which appears to be on a difficult course. Tomorrow calls for 4 miles and 4 x 20-second strides, and Sunday calls for 9 miles. Since Monday is usually my yoga and core day, how do you suggest I tackle all of this without being too fatigued for the race on Monday? Coach Deb: What if you flip Sunday and Monday? Do your core/yoga workout on Sunday, then run your 5K on Monday and after you finish run another 6 easy miles. Or, run a 1-mile warmup, then the race, and finally 5 miles afterward. Is that something you’d consider? Question: I completed my 5K this morning and it was brutal! It was very humid and had ridiculous hills; yet I took my time and was able to run the entire race . I fatigue easily with difficult hills and I have an arduous time trying to keep my pace. What can I do to improve this? I’m getting better because usually after a steep hill, I’m sucking wind so badly that I wear myself out. What can I do to run a hill and recover faster than I am now? Coach Deb: The best way to get stronger at anything is to practice doing it during training. Take a look at this article I wrote on running hill repeats and let me know what you think. Question: I’ve been to Orlando this past few days and I seriously thought I could train for the half marathon while there, not realizing what 107 degrees truly feels like! I couldn’t do it and will be returning home tonight. Should I start yoga tomorrow or run, and how many miles do you think I should try? Coach Deb: I think it’s fine to pick up where you should be on your training schedule. I wouldn’t worry about the missed runs since it was just a couple and you’re so early in your training cycle. Wow, 16 ounces for 4 miles? That seems excessive. To me, anyway.I’d probably have to hit a bathroom if I drank that much (10 ounces gets me through/up to about 5 miles). The person who asked the question runs in southern Georgia so she’s probably sweating an awfully lot! Those are helpful tips for running faster. Thanks for taking the time to write the answer! These Ask Coach Deb posts are great! You’re so welcome, Tina! Thanks for sending the question my way. I like this series! I need to think up some questions to ask you as well. I pretty much gave up speed work after some injuries but maybe it’s time to try again. If you do add speed work back into your routine, go at it slowly and cautiously, especially since you say you’re injury prone. I love this – great q&as and as always, your advice is so spot on! Especially about running on hot and tough courses. Hope to see you soon!